Fight Back Against Pests and Lawn Weeds with Ortho Products. 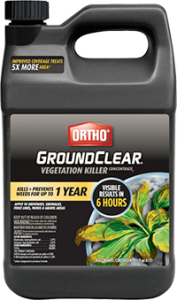 Ortho Insect, Weed, and Garden Disease Control Products. 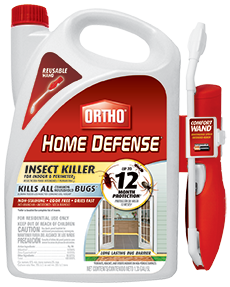 Ortho Home Defense Max Insect Killer, 24 -oz. Ready to use, fast acting formula with up to 12 month control plus kills insect eggs* (Ants, roaches and spiders indoors on nonporous surfaces. Applies to beet army worms, two spotted spider mites and Asian lady beetles). Non-staining and odor-free. Creates a bug barrier. Home Defense Ant/Roach/Spider Killer, 18-oz. Kills ants, roaches, spiders, scorpions and stink bugs by contact. Eliminates 99.9% of household germs. Kills Germs that insects may leave behind • Won’t stain or discolor • Can be used indoors along baseboards, under sinks, refrigerator, stove, dishwasher, kitchens, bathrooms or other places insects may be found. 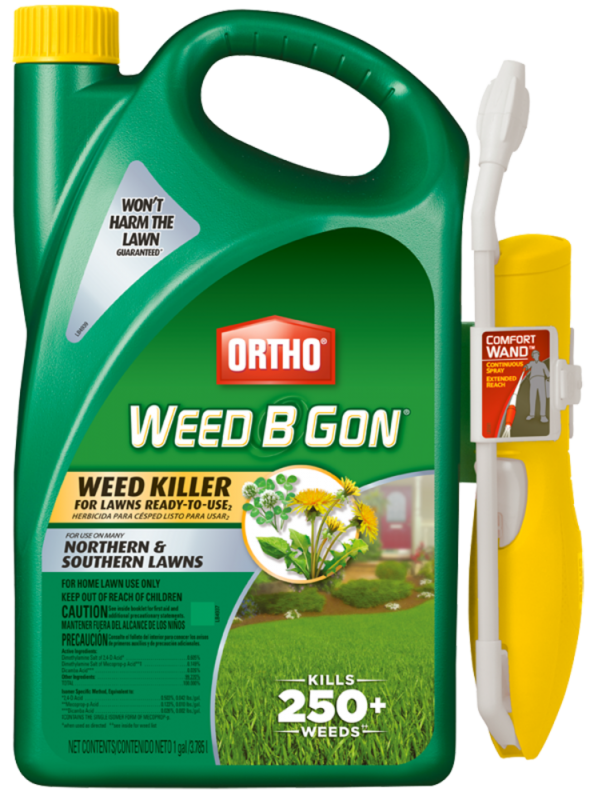 Ortho Weed B Gon Lawn Weed Killer, Concentrate, 32-oz. 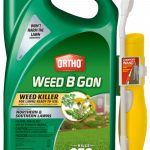 Ortho Weed B Gon 32 oz, concentrate, weed killer, for lawns, kills weeds not lawns, results in 1 hour, kills weeds down to the root, kills dandelions clovers & 250+ other weeds. 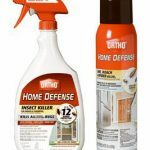 Ortho Home Defense Max Insect Killer With Wand, 1.1-Gal. 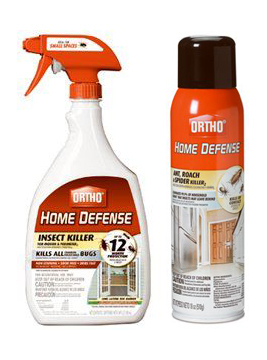 Ortho 1.1 Gallon, Bonus Size, Ready To Use Wand, Home Defense Max Insect Killer, Kills Existing Bugs & Prevents New Bugs From Entering The Home In 1 Application, With Invisishield Barrier Technology New Applicator, The Easy Way To Spray, No Bending, Pumping Or Hand Fatigue, 1 Touch Continuous Spray, Ergonomic Handle, Extended Reach Wand With Multiple Spray Settings. Guaranteed to kill weeds to the roots. With the convenient Comfort Wand® applicator, you can kill over 250+ weeds’ for easy and effective spot treatment without damaging your lawn. 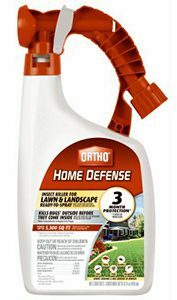 Ortho Home Defense Insect Killer for Lawns & Landscape RTU 32 oz. Fast, effective, targeted and easy to use. Provides effective control on a wide variety of insects but provides a very effective kill on pests that matter most. For home protection (ants, fleas, ticks and spiders). No smell, no reside and quick dry. Exterior perimeter control. Safe to use around kids/pets & helps restore order. Active ingredient: 0.3% Bifenthrin. 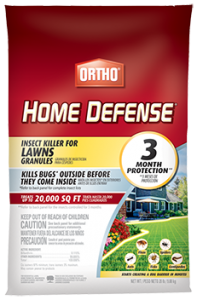 Coverage: 5,300 sq ft.
Ortho Home Defense Insect Killer for Lawns, 10-Lbs. Ortho Home Defense Insect Killer for Lawns Granule 10 LB. Fast, effective, targeted and easy to use. Provides effective control on a wide variety of insects but provides a very effective kill on pests that matter most. For home protection (ants, fleas, ticks and spiders). No smell, no reside and quick dry. Exterior perimeter control. Safe to use around kids/pets & helps restore order. Active ingredient: 0.115% Bifenthrin. Coverage: 10,000 sq ft.